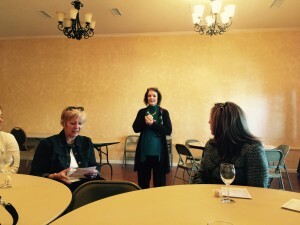 Since our event was a Charlotte Wine Tour, we needed to stick closer to the area. We opted to visit Dennis and Rocky River. They are both within 45 minutes of the Charlotte area. 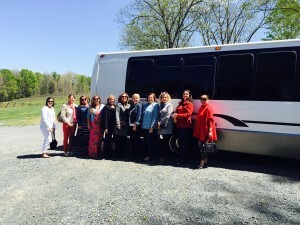 Pat and her wonderful friends enjoying the ride on Johnny B’s new Limo Bus. 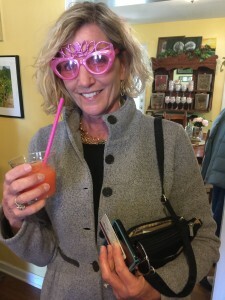 If you have never been to Dennis Winery, you must visit! It is conveniently located close to Charlotte- in the Albemarle area. The staff and owners are very attentive and helpful! If you are searching for a beautiful venue for your wedding, please keep Dennis Winery in mind! 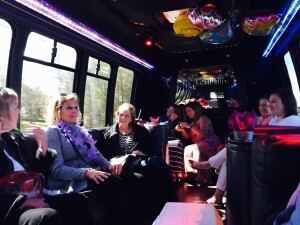 On the Johnny B’s Limo Bus- headed towards Rocky River now! Pat’s friends (I am so lucky to be included! I am the second from the right) posing for a picture in front of our limo bus. Our Chauffeur Frank was kind enough to take many photos for us. He also loaded and unloaded all of our goodies for us! Rocky River is also very close to Charlotte- located right next to Reed’s Gold Mine out by Albemarle, NC. Currently our wine tasting includes a selection of eight Rocky River Vineyards wines as well as samples of our wine slushies and, seasonally, hot mulled wine. The cost for a tasting is $8+tax per person. A souvenir glass with a tasting is an additional $2. We do offer 1 – 2 samples free of charge, if you are just trying to find the right wine for you. If you have not had a wine slushie yet, you are missing out! SOO YUMMY!! Pat, the lovely hostess and birthday girl! 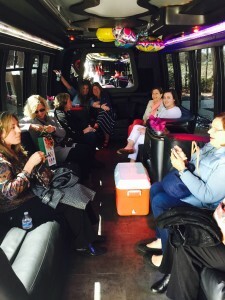 Thank you for such a lovely day, for including me on your wine tour, and for choosing Johnny B’s Limousine Service to help plan your event. Happy Birthday! 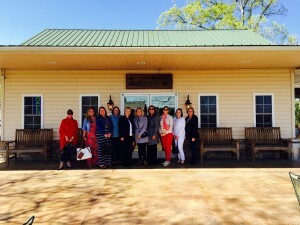 Please call 704-649-3068 for planning of your Charlotte Wine Tour! Since their humble beginning in 1997 where hobby turned profession, Dennis Vineyards strives to produce top quality wines of all kinds for enjoyment by all, connoisseur and novice alike. Nestled in their own quaint little corner of North Carolina wine country, Dennis Vineyards is located in the small little town of Albemarle, just a short 40 minute drive from Charlotte. 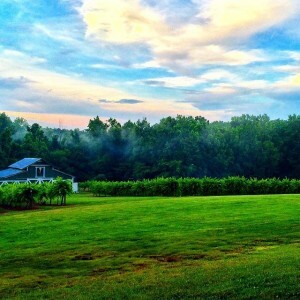 Boasting eleven acres of pristine muscadine vineyards and gently rolling hills, it truly is a sight to see. Specializing in the native grape of the South, the muscadine, the Dennis’s grow over ten different varieties of this highly unique and superbly flavorful grape. Many people do not realize that there are well over 150 different varieties of muscadine grapes and while some are more common in winemaking, others are more common in jellies and jams or the fresh fruit market. With a never ending desire to create new and unique wines and have a lot of options for all the varying palates, Dennis Vineyards produces over 30 different wines. Even from the very beginning, they have been producing wines in numerous sweetness levels (including their muscadines!). Many varieties come in dry, semi dry and sweet. Whether you prefer traditional dry French varietals, fruity muscadines or playful fruit wines, you are sure to find a wine (or two!) perfect for any mood, pairing or special occasion. Offering tastings every day and tours on Satudays (or through the week by appointment), Dennis Vineyards is a great place to spend the afternoon sipping wine, enjoying the view and submersing yourself in this family’s passion. Since 2003, Rocky River Vineyards has been growing muscadine grapes, which are indigenous to North Carolina, filled with antioxidants, and produce a sweet table wine. Our 45 acres are snuggled into the gently rolling hills of eastern Cabarrus County, with Big Meadow creek flowing through the property toward Rocky River, which is how the name was born. The butterfly on the label is representative of a new life, a new beginning. The vine is an indication of dreams unfolding, and the grapes represent the future. It is a relaxed, yet sophisticated and peaceful setting to enjoy a glass of award-winning wine, while taking in the beautiful panoramic view of the vines. Rocky River Vineyards wine ranges in flavor from a sweet, red or white muscadine wine to classic, dry varietals such as Chardonnay, Cabernet Sauvignon, and a Merlot blend, among others. During your visit you can find unique gifts, keep an eye out for wild turkeys and deer as you wind through the woods, and over the creek along the walking trail, and enjoy a picnic on the grounds. 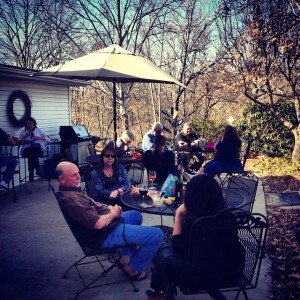 Throughout the year, Rocky River Vineyards hosts events including spring and fall festivals, summer parties, grape stomping, a holiday open house and more. The vineyards is also a beautiful place to hold weddings and private events.